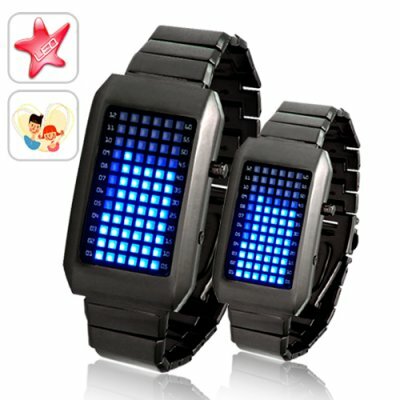 Successfully Added Two Kelvin - Japanese Style Inspired LED Watch Pack to your Shopping Cart. Introducing The Two Kelvin Japanese LED Watch Pack, a dynamic duo from the planet DAMN THESE WATCHES LOOK GOOD which increases your coolness factor by like a gajillion times. So much so that you'd pwn John Coltrane and Jean Luc Picard it a coolness melee! You mean these two watches really tell the time? Yes. Even though The Two Kelvin Japanese LED Watch Pack embodies Flock of Seagulls style and Duran Duran design with its Miles Davis Kind Of Blue LED's dancing against The Void like Kelvin Bacon dancing in Footloose or Kelvin Costner dancing in Dances With Wolves, the watches in this Japanese LED watch pack do in fact tell the time and does so really efficiently too! The One Kelvin is slightly smaller than the Zero Kelvin which makes it perfect for your shorty*. Yeah pick up a pack, one watch for you and one watch for your girlfriend. She'll love it and she'll LOVE you for it. And by LOVE we mean you'll be getting SOME...brown chicken brown cow! Both watches operate the same way. Tap the display button on the right side of watches and the screen will light up like Geeks at Comic Con. There are 72 blue LED lights on the watch face. The first 12 LED lights display the hour. The other 60 LED lights display minutes. Cool huh? Yeah these watches are so cool they were Kelvin Klein jeans and read Kelvin and Hobbes comics! Yes, Brad and Angelina are Two Kelvin pack customers as are Marvel super heroes Cloak and Dagger, Musical Super Duo Karen and Richard Carpenter, Cartoon Leading Man and First Lady Homer and Marge Simpson, as well as Notorious BIG and Faith Evans, Andre Agassi and Stefi Graf, and Kamin and Eline from Kataan. In reality, this watch pack is perfect for stellar cartographers, Gundam mechanics, 4chan-ners, and anyone who likes to spend most of their time at work surfing tvtropes.org! Just google "Japanese LED Watch" to see how much these timepieces sell for online. Notice how they normally retail for close to 15x the price we're selling them for. Even if you don't intend on buying a pack for yourself, stock your online store with these headturning watches to lock in some amazing profits! Unlike other online stores where you'll have to wait several weeks before you receive your orders, order your Two Kelvin - Japanese Inspired LED Watch Pack from Chinavasion today and we'll express ship it out tomorrow. That way you can be the first to offer your customers this amazing Japanese LED touchscreen watch combo! *Shorty - by "shorty" we don't mean a short piece of CAT5 ethernet cable as its frequently called, see "shorty" in urbandictionary.com (I'll send you the pics over lan, I'll connect with a shorty)...rather we mean girlfriends which most geeks unfortunately don't have. How do I change the time, date, and luminosity on these watches? What type of batteries do these watches use? These blue LED watches use two CR2032 watch batteries. Other names this type of battery goes by are button cell, silver button cell, or coin cell batteries. Are these Tokyo Flash watches? No, these are better because they cost almost 1/10th the price of a Tokyo Flash watch and is also backed by Chinavasion's famous 12 month warranty. Why is The Zero Kelvin called The Zero Kelvin? Why is The One Kelvin called The One Kelvin? Because we imagine that the type of person who would wear a watch like this would also be able to bend the laws of Physics as well as manipulate and reshape the Matrix as they see fit. You mentioned that this watch pair is perfect for stellar cartographers, Gundam mechanics, 4chan-ners, and anyone who likes to spend most of their time at work surfing tvtropes.org! What if I don't belong to one of these groups?This watch is also perfect for LOLcats, fans of AKB48, world class Mario Kart players, and anyone who knows all the words to No Parking On The Dance Floor by Midnight Star. I ordered these last week and just got them today. They got here on time , but due to some errors on my part I didn't get them until two days later. Like I mentioned above, these watches are very cool. Nice color, bright display, and easy as hell set up. And the way these display time and date is truly unique. I am a huge geek and I just love these LED watches. I ordered the two kelvin in particular so that my father and I could each have one. I hope that when he gets off of work today he'll enjoy his watch as much as I do. I've been checking your site out for months before ordering and I must say, you guys rule.